This week we have been in Pahrump, Nevada – 60 miles west of Las Vegas and 60 miles east of Death Valley. We are in a nice park full of friendly snowbirds (like us) and with all kinds of amenities and activities, but the real meaning to the week has been friends and family, or chronologically, family and friends. As we were driving through Las Vegas toward Pahrump, my cousin Lisa and her husband Chris were also there for the World Chili Cook-off competition held last weekend at Mandalay Bay. Their daughter, Kylee, and my aunt Bonnie flew in Thursday evening. 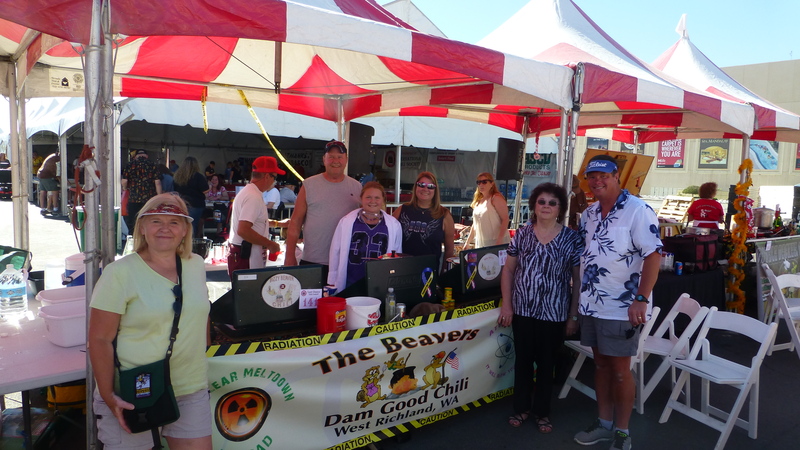 Chili cook-offs have been a hobby for their family for many years and we have always hoped to be able to go have the experience. It finally worked out! On Friday, we drove back in to Las Vegas, visited with them, and tasted lots of yummy chili. You buy tickets for $1 apiece, decide from whom you’d like to taste chili and then get a very small cup. And you do that about 10 times! (Of course, we got family chili for free.) It is amazing how subtle the differences are in how the chili can taste. It was fun to go to the chili cookoff and great to see family! In the middle of our stay we did a few activities here in the park and around the area. We found that even though we are 60 miles east of Death Valley, that access is really just one small portion of the park. Death Valley National Park is huge and we were just too far away to do much. The weather is still too warm to leave Elko in the truck except in the morning and evening and the visitor sites in the park were too far away to leave him here all day and evening. We will drive through the park when we leave here but our experience will be limited. Death Valley will require a separate visit, staying right in the middle of the park at Furnace Creek and branching out from there. That’s okay, we can do that sometime! 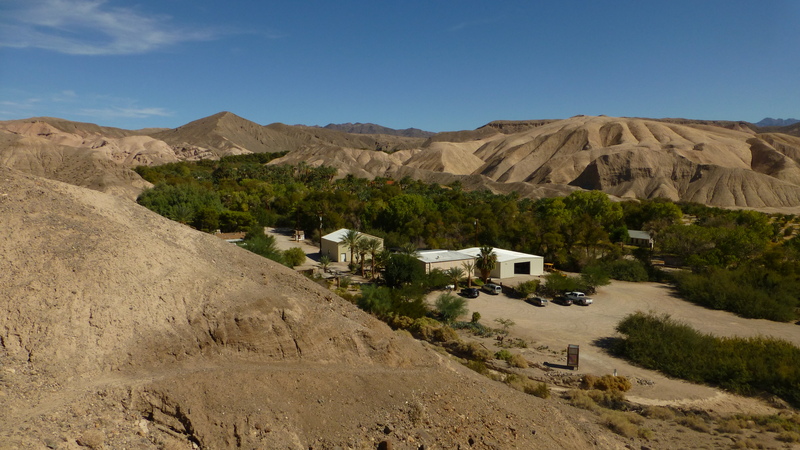 The most interesting excursion we went on was to the China Ranch Date Farm. At the southern edge of barren Death Valley is a beautiful, natural oasis where a Chinese man raised lifestock in the late 1800’s. The wife of an owner in the 1920’s planted a few date trees. 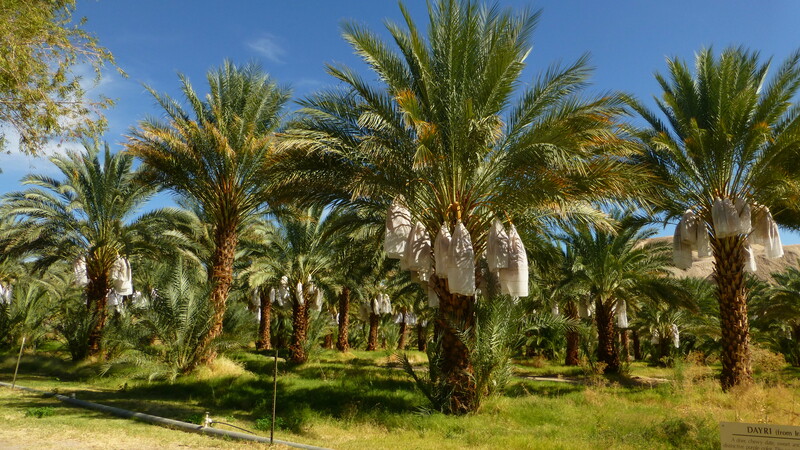 Current owners moved to the farm in the late 1970’s and planted many more date trees to run as a family farm. Currently, they grow 18 varieties of dates and ship them around the country. It is quite a drive into the farm but the difference between the desert and the date farm oasis is amazing! They advertise date shakes and baked goods. We tried both! The week here in Pahrump is ending with a visit from Kent and Pam as they head to Las Vegas for a tennis tournament. Do you think if we just stayed put near Las Vegas we would see lots of you? 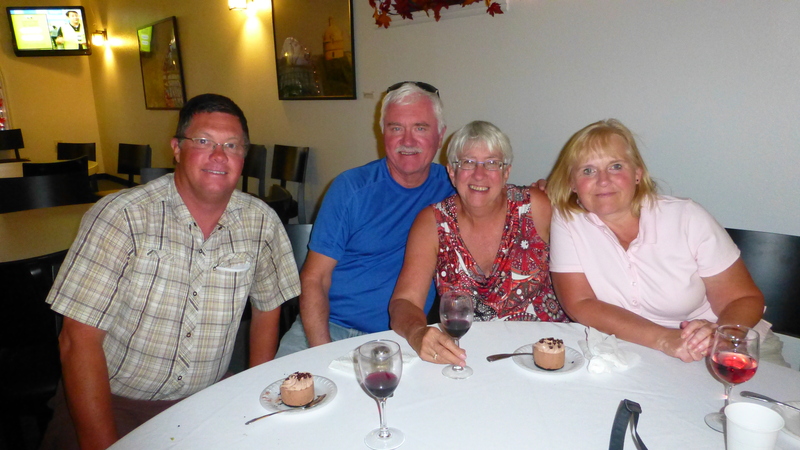 We visited, played pickleball, did the winery tour and tasting (connected to our RV resort) and went to the winery clubhouse dinner. As always, it was great to spend time with Kent and Pam! We are so glad they travel a lot because we think we’ll be able to hook up with them fairly often. It has only been a few weeks since we saw them in Delta, Utah. We are also so excited that friends Darrell and Cindy have already made their reservations to go to Farragut State Park while we are camp hosting there in July and August!! I get to start working on reservations for Natasha, Seth and Archer to come north. I know my parents will come! We would love to see anyone who thinks northern Idaho in the summer sounds good! We got another camp hosting job this week too! We will be at Cove Palisades State Park, north of Redmond, Oregon for the month of May. If anyone might be available to come see us there, we will be hosts at the Crooked River Loop, site E73. Leaving family and friends behind is the hard part as we go on this adventure– seeing you on the road is very exciting, and appreciated!! Always fun to hang out with you all, wherever that is!